On April 10, the Chinese Ambassador to Estonia H.E. Mr. Li Chao hosted a reception at the residence for the players and organizers of the China-Estonia Kickboxing Competition. Nearly 50 guests attended the event, including the chairman of Tallinn City Council Mr. Mihhail Kõlvart, president of First Fighting Club Mr. Ignor Golubev, head of the Chinese delegation Mr. Liu Zhifeng and relevant media. 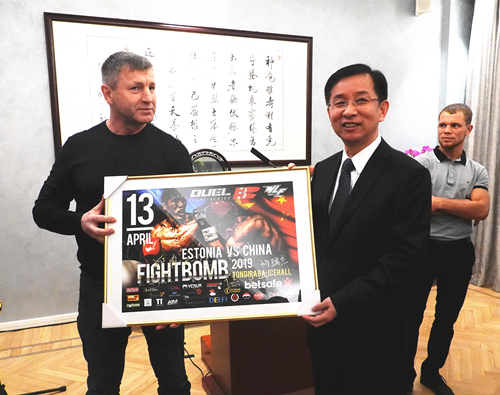 Ambassador Li Chao first welcomed all the guests to the reception and said that on the evening of April 13, the masters of China and Estonia would gather in Tallinn for the first time to compete kickboxing. It was meaningful to make friends, learn from each other and improve skills together through kickboxing competition. 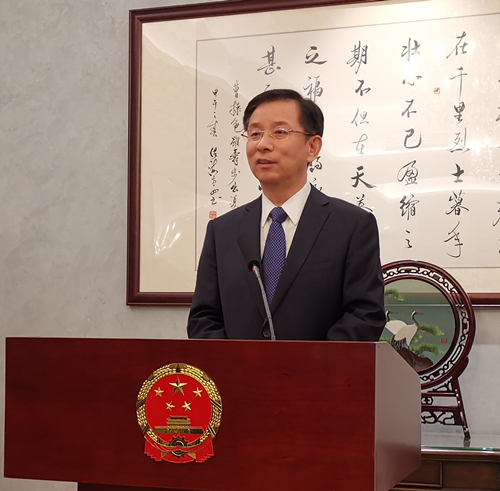 Ambassador Li gave a briefing on Madame President Mrs. Kersti Kaljulaid's visit to China last September and stressed that in recent years, the people-to-people exchanges between China and Estonia had developed rapidly and played an important role in promoting bilateral relations. The kickboxing competition was really a good try to promote high-quality people-to-people exchanges which were the consensus reached by the leaders of our two countries. "I sincerely wish the competition every success and the Chinese delegation a good time in Tallinn." Ambassador Li said. 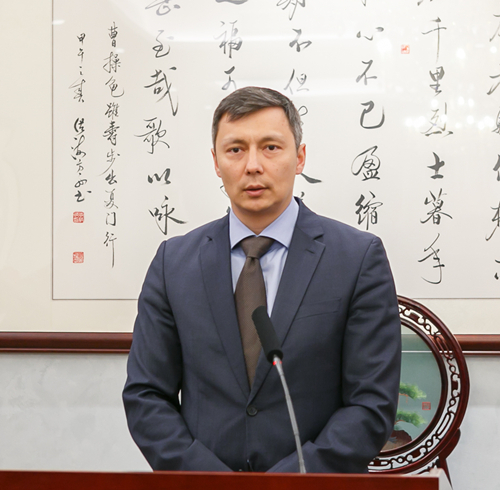 Chairman Mihhail Kõlvart thanked the Chinese Embassy for its strong support for the people-to-people exchanges between Estonia and China. "In recent years, the people-to-people exchanges between Estonia and China have become increasingly frequent and developed in various forms, fully indicating the continuous deepening of the friendship between Estonia and China. It is a good way of exchanges by competing, which will enhance friendship and skills. Wish the competition a great success." The Chairman said. At the reception, the representatives of both sides exchanged views actively. Ambassador Li Chao also had an interview with the Chinese media. Chinese Embassy in Estonia and Tallinn Zoo co-hosted a "Panda Evening"